From time to time a new prospective client calls and asks, “so what kind of screaming deals have you gotten for your clients?” I realized that the best way to answer this question is to write a blog about how to benefit from hiring a Car Buyer’s Agent! First, I have placed this photo of Gio Iuculano, DDS, the medical director for Winchester Dental in Winchester VA. 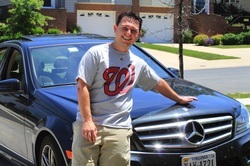 He is shown here in front of his Mercedes lease. We got the monthly payment at $359/mos with only his “upfronts” (taxes and first month payment) out of pocket. The MSRP on this vehicle is over $41,000 and yes, it was a TON of work to get to the payment. That said, his payment on this Mercedes is lower than a lease payment on a top of the line Camry XLE, V6 with a sticker of $34,000, so yes, we would call this an amazing car deal. Other deals, our used car finding Guru out of our Chicago, Illinois office found a used 2008 six cyl Honda Accord EXL with super low miles (under 60,000) for $10,000.j We were just beginning to think that our client had rather unrealistic expectations. But, Arthur found it! It was in mint condition. Though terrifically important, all our Car Pal buying service clients would agree, it is not all about the amazing deal we get for them. We are reminded daily that our clients are absolutely thrilled about the time savings and frustration savings we give them. More than one client has made that one hour drive to see that perfect vehicle at that perfect price, only to be told that it was purchased earlier that day. A blog, however, is not supposed to be a sales pitch, it is supposed to be engaging to the audience. So as the writer, I will leave you to think about this: What kinds of activities would YOU rather do than spend too much money and/or too much time searching for and then negotiating for a vehicle? Let your imagination run wild! The most recent client, Jim Feeney, director of Jomonola Charity Bike Tour who retained us would rather spend his extra time volunteering for non-profit work. It is not always for selfish reasons that we seek an expert’s assistance. A car buyer’s agent could merely be a means for our clients’ to be available to help someone else. Many interesting perspectives to contemplate. Until we meet again, it is Lindsay Graham, Car Buyer’s Agent and expert, signing off.